It was Sunday morning… Dan needed to do some work… and I needed to find something to do with Chance outside of the house. What better than an early matinee? Easier said than done when the only movie out that falls into the G or PG rating is Alvin and the Chipmunks, which we’ve already seen (and definitely was not worth seeing a second time). Thirty minutes later, Chance and I were driving down Massachusetts Avenue, looking for what I thought was going to be a huge movie theater with a mongo parking lot. Boy, was I surpised, as we almost drove right past the little marquee sign in the innocuous location. 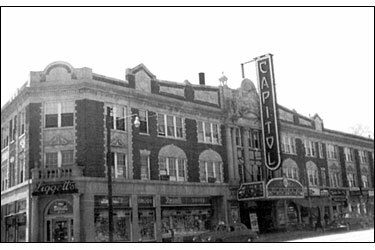 The Capitol Theater, which opened in November 1925, is truly a hidden gem and a must-visit for anyone who enjoys period theaters that are family-friendly and still true-to-form from their bygone days. This little 6-plex really made my day. As soon as I walked through the front doors, I realized we were in for a treat. The lobb y, with it’s long concession stand, was filled with the aroma of savory popcorn and we could hear and see the popcorn popper furiously spitting out freshly-popped kernels. When I checked out their website after the fact, I found out that the popcorn is freshly popped in canoloa oil and served with REAL butter (if you desire). So it’s almost healthy compared to that trans-fat ladened crap they serve in normal theaters! They also have Pepsi-brand soft drinks, fruit juices, I-CEE frozen treats, candy, cookies and Richardson’s Dairy-fresh Ice Cream. 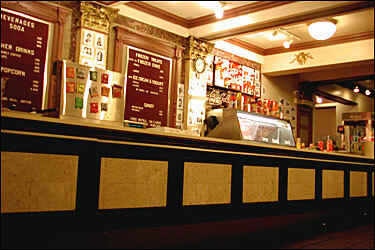 Tell me ONE other place you can actually get REAL popcorn with butter, in an authentic old-time theater, where the seats are comfortable and the quality of the movie and sound is awesome. I’m sure they are around… but the beauty of this place is that it was refurbished with state-of-the-art equipment, while keeping the facade, murals and sculptures of the original theater. Tickets are very reasonably priced. On the weekends, an adult is only $7 and children under 12 are $5. So for $12 bucks, Chance and I were on our way. We grabbed 2 small bags of popcorn and headed into theater #1. 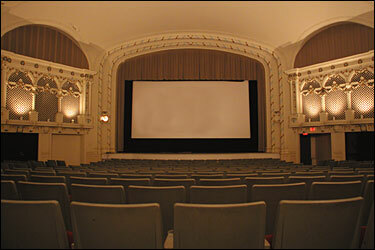 Also called Auditorium #1, this is the largest theater and contains the original big screen and proscenium arch. It has stereo surround sound and seats 315 people. The screen is approximately 25′ by 19′. The grills on either side of the stage once housed the pipes for the Capitol’s magnificent organ. Unfortunately, the organ was removed in the 60’s. If you check out their website, you will see this place is just full of history — including a reported ghost in theater #6, which used to be the stage! We had a great time… so good that I will definitely schlep out to this place again. 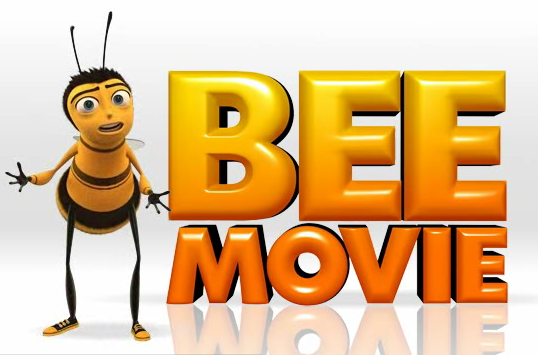 The movies tend to be a tiny bit outdated — which turns out to be a good thing if you missed that movie you were dying to see a few months ago. They do however, have a few current flicks on show as well. This place is a great find as well… and I couldn’t walk away without buying myself a funky little necklace and Chance a cool wooden toy that hangs from a bouncy spring. 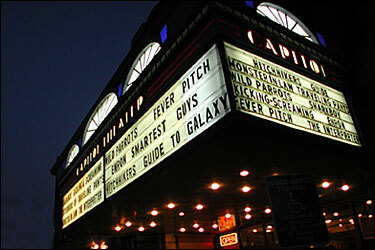 So, the next time you are looking for something to do on a weekend day with the kids — or on a date night with your partner of choice — head to this little theater in Arlington for a surprisingly great time and then hit one of the many restaurants lining Mass Ave in Porter Square on your way home! Also, if you are feeling house-bound with a new baby… this theater also features baby-friendly movies every Monday afternoon. What else could you ask for??! !